Happy Quilting: A Splendid Day!!! Today is indeed a very Splendid Day because it is the day that has been anticipated by so many for a year :) Today is the day The Splendid Sampler book has arrived, so exciting!!! 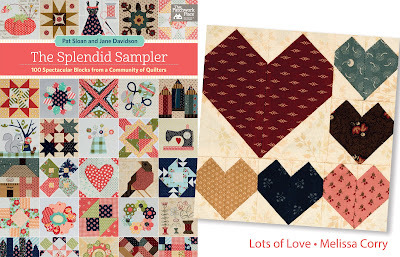 This whole last year I have been sharing Splendid Sampler blocks on Saturday's and it is just so fun that now we have the book!!! This Splendid Sampler has been such an amazing journey!!! I was so honored to be able to create a block for this project and it still makes me smile every time I see someone's fun version of my Lots of Love block!!! And now it is part of this amazing book ! My personal Splendid Sampler is so close to being done, but has been put aside for a few deadline projects ;) Here are the rows laid out without the sashing. I have since sewn all the rows together including the extra sashing rows, and pressed them all. Now I just have to sew the block rows and sashing rows together to make the quilt top. It is currently hanging over my sewing room door so that I see it every time I walk in, and get more and more excited to squeeze some time in to get the top finished ;) I can't wait to share it!!! It has just been incredible to be a part of the The Splendid Sampler. It was so great to meet so many new friends in the Sew Sampler Facebook Group and see everyone's quilts come together ;) And I hear that the group is going to continue together, starting again in just a few weeks!!! Only this time, they will be assigning a block from The Splendid Sampler book each week ;) So fun!!! And of course, it wouldn't be a Splendid Celebration without a giveaway. 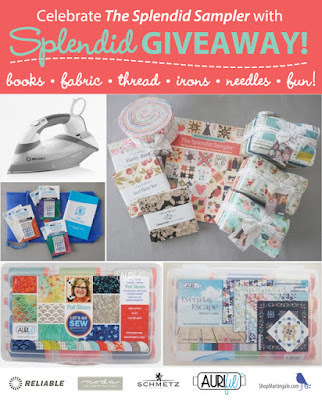 And our friends at Martingale have a huge giveaway!!!! Pop on over to the Martingale blog for your chance to win some amazing prizes from Martingale, Moda, Aurifil, Schmetz Needles, and Reliable Irons! So fun !!!! Good Luck!!!! Thanks for popping in today and each day!! I hope you have a very Happy (and Splendid) Quilting Day!!! Oh, my goodness! It's going to be fantabulous! I love your setting. It's perfect! Cake Mix Bake Off Finale!!! Poppies Quilt Tutorial for Ava Rose Hop!!! And then There Were 20!! !